Every night after dinner Tristyn and I go for a walk outside. She holds my finger as we go four houses down to the left. We have to stop by our neighbor's lampost to say hi to her friends. Knome 1, Knome 2, Froggies, Knome 3 and Lady Bug. She can point out their eyes, noses, fingers and their red hats. Then we walk across the street. BJ's friend Tommy has a FUN yard! Mickey, Minnine, Donald, Snow White and the 7 Dwarfs are there! And loves to kiss her on the nose. She can also point out her flowers and her bow. She "high fives" Donald on his beak. 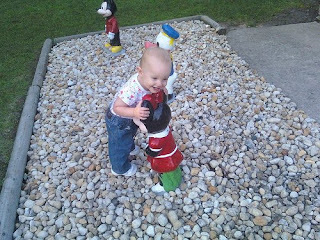 Last night she had a full 2 minute conversation with Mickey. Then she picks out her rock. Every time we visit she has to bring home a rock. And sets it on the wooden bench inside our front door. We now have 6 rocks there. She walked over to me and climbed up into my chair. I asked if I could have a hug. And I got my first REAL hug from my daughter. A little hand pat on my back and a squeel. this made me cry. there is nothing better than connecting with your child. 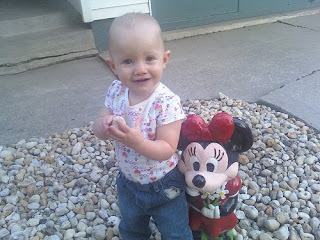 tristyn is so lucky to have you- you love her with all your heart and then some. What's with little kids and rocks? Miles can't get enough of them, either! She is such a sweetie-pie. You are lucky to have her and she is so lucky to have such a wonderful loving mommy like you!